last thursday, we got more snow in nashville, which meant that most of us were home + off the roads by mid-afternoon. what to do with an expected few free hours? cook! on my to-make list, i put tortellini soup with cannellini, kielbasa + kale, a vodka + elderflower-tini, + these butterscotch bourbon bars. i found this recipe on erin’s food files, a blog run by a great cook + fabulous fellow nashvillian. when the snow hit, i knew it was the perfect time to try this out. coincidentally, my honey (who loves bourbon) was scheduled to return home that night from a business trip. i feared that his flight would be canceled due to weather, but wanted to have a batch of these butterscotch bourbon bars ready just in case he made it. 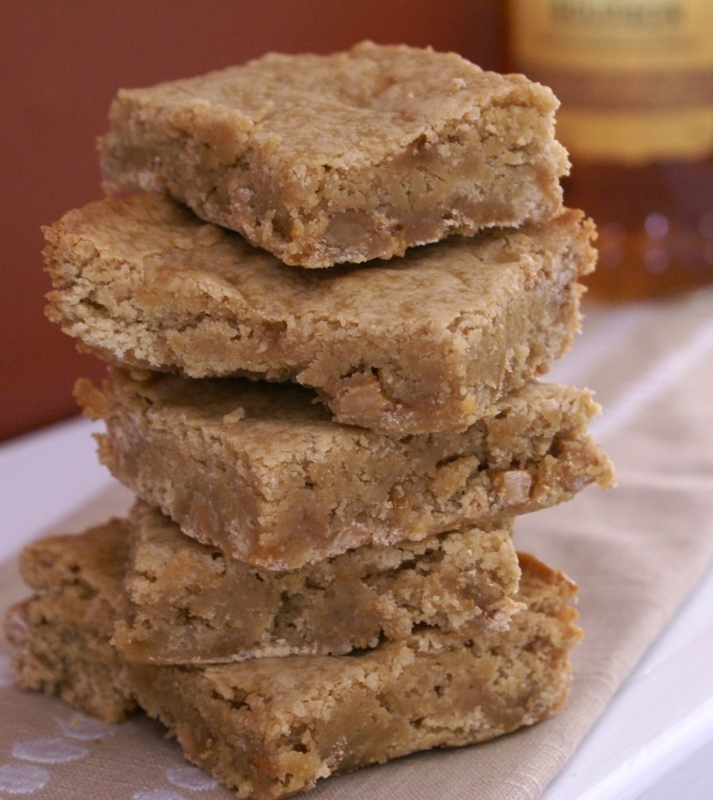 these bars are amazing – slightly rich with a kick from the butterscotch + bourbon. their texture is moist, smooth, a little crunchy here + there from the chips, which i love! i wouldn’t have thought that butterscotch + bourbon would mesh so well, but guess what? they do! + honey? he made it home safely that night to little ol’ me, our snuggly pup, + these fab sweets. thanks again, erin, for the idea! preheat the oven to 350 degrees. mix the flour, baking powder, salt, + light brown sugar together. in another bowl, whisk the butter, milk, vanilla, + egg. pour the liquid mixture into the dry batter. add the bourbon + fold in the butterscotch chips. pour the batter into a greased 9” pan. use a spatula to cover the entire pan with the cookie batter. bake for about 20 minutes; use a toothpick to test the center. the toothpick should not be completely clean but with very small bits of cookie dough on it. i did a quick search + it looks like a small percentage of the alcohol remains even after these are cooked – so, while no one could get tipsy off of these, some alcohol will remain. hope this helps + i hope you love ’em once you make them! We are huge bourbon and whiskey fans, too, so I can’t wait to try these. Thanks for sharing a great recipe! These look so good! I love bar cookies…bake and cut into squares! I bet they’d be good with white-choc chips too. BTW…I’m hosting a really great giveaway for some gourmet specialty food products on my blog, so pop before Friday by to enter. These look (and sound) amazing! I’m printing off the recipe as I type this! YUM! I LOVED these, glad to see you did too! Was just tweeted this recipe by a friend. these look yummy – can’t wait to try them! i’m so glad you stumbled across my blog + this fantastic recipe. you’ll have to let me know what you think of them! enjoy! It’s а ρity you don’t have a donate button! I’d certainly donate to this superb blοg! I guess for now i’ll settle for book-marking and adԁing your RSS feed to my Google account. I loо forward to neww updates andd will talk about this blog with myy Facebook group. Next post: super bowl party – call for recipes!